Will Aishwarya Rai Bachachan re-create her magic on the silver screen in her second innings? From being proclaimed numerous times as the world's most beautiful woman to being the proud daughter-in-law of the contemporary Bollywood's first family – the Bachachans, Aishwarya Rai Bachchan has seen it all! Her poise, grace, looks, style and ability to mesmerise people with her grey-green gaze, splendid charm and down-to earth, disarming laughter – both at national and international platforms – is the stuff legends are made of. And yet, this ethereal beauty has not been safe from banter and criticism, especially when it came to her acting abilities, many of her sartorial choices and most recently, her post-baby weight issues. Did Aishwarya let it all deter her, though? By the looks of it – hardly! Known to possess a solid logic, an eye for opportunities and a cool demeanour, Aishwarya has so far managed to do a great job with her life. Her most recent appearances at the Cannes Film Festival 2014 gave a strong message and a befitting answer to her critics. Dressed in a golden, mermaid Roberto Cavalli dress, Rai took the international stage with a storm! And, now there's the news of her signing two films – with directors Mani Ratan (who gave Aish her first break in Tollywood's Iruvar), and Sanjay Gupta. Aishwarya herself maintains that, as now her toddler Aradhaya is slightly grown up, she (Aish) looks forward to getting back to being under the spotlights full-time. Will the stars favour Aishwarya Rai Bacahchan in her second innings, post motherhood? Will she be able to re-create the magic of her spectacular performances from films like Devdas, Hum Dil De Chuke Sanam and Guru? Well, Ganesha takes a look at her Personal Horoscope, and proclaims that Aish's fans may have wait for that somewhat – and post that too, things may not get as starry as they were in her glorious days. How and why? Read on. Ganesha observes that Aishwarya is currently under the influence of the Rahu major period and the Saturn sub period, which shall rule till 25th May 2015. The ensuing sub period will be of Mercury, which will rule till 12th December 2017. The transiting Jupiter will form an Opposition aspect with her Natal Jupiter in June 2014. The transiting Rahu shall enter her Ascendant House in July 2014. Saturn will transit over her Lagna/ Ascendant Lord Mercury after November 2014. How will Aishwarya's 2nd inning be? Ganesha feels that it will be only after May 2015 when Aishwarya will be able to come up with a really crowd-pulling movie or performance. Till then, the scope of her courting and blazing the limelight like her days of glory is less. This is because Mercury's sub period for her starts in May 2015. The Rahu major period and the Saturn sub period too indicate a sort of 'slow down' in her career progress, because both the planets represent a larger cycle and slow moving. 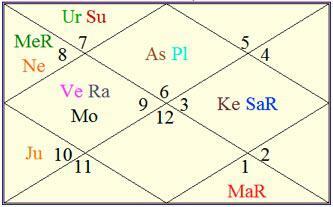 And, specifically because, Saturn is in the Karma Bhuvan and Rahu is in the 4th House in Aish's Chart. This means that Dasha Naath and AntarDashaa Naath (the ruler of the major period and the sub period) both are placed at important angles of Rai's Birth Chart. Ganesha, thus, feels that Aishwarya's career should pick up a bit after the Mercury sub period begins in May 2015. However, Ganesha feels that she will not be able to achieve fame that she has achieved in the past, mainly because she is under the influence of the Rahu major period. She may find it difficult to manage personal and professional fronts together, while the Rahu Dasha operates. So let's see, what happens, when she actually starts working again in the films. Nonetheless, we wish her good luck. May Lord Ganesha bless her!